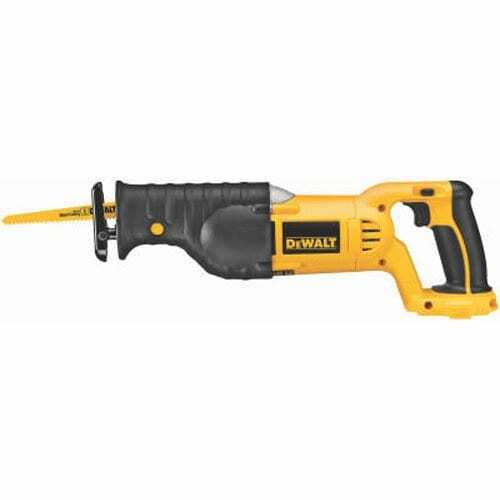 We trust the DeWalt cordless reciprocating saw not just because it is made by one of the leading power tool manufacturers but also because it has pretty much all we need. It is rugged, powerful, and can cut anything that is not a rock. It took us a long while to finally find a reciprocating saw that made us happy and we imagine it is just as hard for you. We put this review together to help you determine what makes a good recip saw and how you can have it. The multi-position collet makes flush cutting easy. The variable speed and long stroke allow for flexibility. Blade changes are easy to do. The open-top pivoting shoe lets you see what you are cutting. It is a bare tool that does not even come with a case. When we were building a garage as new DIY renovators a while back, we found ourselves looking at a long list of tools required to finish many different tasks. Apparently, we needed a circular saw with a masonry blade to destroy part of the patio, a cordless drill for bringing down an old cupboard attached to an outer wall, an angle grinder to get rid of a rusty old wire fence, some bars to remove plaster and similar materials, and a whole lot more. We were able to buy the tools we needed and got our work done, but not until we were told that a reciprocating saw could have done what half of our new tools could do. A reciprocating saw like DeWalt’s cordless 18V saw is more popularly known as a demolition tool, but its capabilities extend way beyond tearing things down. The DC385B 18-Volt cordless reciprocating saw is for the contractor, the average handyman, and the aspiring DIY-er who wants a versatile and portable tool for anything that needs cutting. As we did renovation after renovation, we realized that this DeWalt reciprocating saw can cut wood, metal, and other materials like tree branches, steel posts, stucco, and more. It also runs on batteries, so we simply stock up on batteries and take it anywhere. Reciprocating saws are highly versatile because they can be fitted with different blades for different applications. You can cut through metal pipes and nails with fine-toothed blades, wood and plaster using coarse blades, and stone, cast iron, and tiles using toothless, tungsten carbide abrasive grit-coated blades. Recip saws can also cut vertically, horizontally, and in every other direction or corner that the exposed blade can get into. Regardless of power source, reciprocating saws are compact and portable. They are never a nuisance no matter where you keep them. You can also bring and use them anywhere especially if your saw is cordless. If it is corded, simply bring an extension cord along and you should be fine. Reciprocating saws are convenient to use because they cut quickly provided that you have good blades and a stable power source. Their speed and versatility cut the time required to finish each job. Start cutting in the middle of the material by using the recip’s shoe as a pivot placed against the material. Then make a hole by pressing the blade tip against the material. A recip saw is useful for making wall indentations for wiring especially since this task often has to be done at odd angles. You can detach a window or door jamb by using a reciprocating saw to cut the jamb’s nails. This technique applies to any job where it is not possible to pull out nails and pins. Simply saw off their heads. Cutting or fitting windows usually involves sawing through tight spaces, which is the recip saw’s main talent. A reciprocating saw is more than capable of taking down branches or getting rid of shrubs without needing as much effort as an ax does. You can use reciprocating saws to change piping especially since pipes are usually located in areas that full-length saws can’t reach and can easily be sawed off using a recip. The DC385B has a variable speed motor with a range of 0 - 3,000 spm. The stroke length is 1 ⅛ in, allowing for deeper material penetration and faster cuts. Key features for added comfort and ease of use include the open-top pivoting shoe that improves stability and accuracy, a keyless blade clamp for easy blade changes, and rubber handles for better grip and control. A recip saw’s cutting speed is one of the factors that affect the quality of the cut. Having variable speed control settings lets you adjust the cutting speed to match your material and achieve your preferred cut. The DC385B can run anywhere between 0 and 3,000 spm. You can directly control the cutting speed by pressing the speed control trigger, which is conveniently located on the handle. Direct speed control is most important when easing into a cut because it gives you a “soft start,” meaning the saw does not blast to 3,000 spm right away, possibly causing the saw to jerk and cut something you do not want to cut or injure you. The absence of a cord gives you the flexibility to use the DC385B in nearly any position that a cord may hinder the saw from getting into. In addition, there is the convenience of portability. You can use the reciprocating saw even in remote work sites provided you have enough batteries in stock. The DC385B’s four-position blade clamp further extends the capabilities of this already versatile tool. You can cut up, down, left, and right, making it easier to work in tight spaces at odd angles. This feature also makes flush cutting easy especially if you are cutting a bar or a pipe against a flat surface. Before we bought the DC385B, we browsed customer reviews of this product on various websites. We discovered that this recip saw has quite a lot of fans. Needless to say, their positive reviews were more than enough to convince us to buy the DC385B. Many buyers commented on how the DC385B delivers a lot of power despite being cordless. They also loved the versatility provided by the four-position blade clamp. Most of the negative feedback was about how the recip saw does not come with blades, a battery, a case, and a charger. While we also consider that a minus, we believe it has nothing to do with the saw’s performance. The RS7 reciprocating saw from Bosch has a capable 11-amp motor that delivers 1 ⅛-in strokes at a variable speed range of 0 to 2,700 strokes per minute. The stroke length is the same as that of the DC358B but the maximum speed is a lot lower. When it comes to the ease of switching blades, the RS7 takes it one step further and puts a tool-free blade change system in place so you will not need a single wrench. Meanwhile, the soft-grip saw handle is ergonomically designed to ensure maximum operator comfort, especially during extended work periods. Finally, one of the little things about the RS7 that are worth noting is the dual LED lights that illuminate the work zone. Porter Cable’s PCC670B offers a nice balance of performance, comfort, and convenience. Its motor has a variable speed range of 0-3,000 spm and delivers 1-in strokes that can take on a wide range of materials quickly. The contoured, overmolded handle help reduce the transfer of vibration to your hand, delaying the onset of fatigue and increasing cutting precision. It has a tool-free blade release mechanism for effortless blade changes, a conveniently located speed trigger, and a pivoting shoe that improves stability. The cordless BDCR20B reciprocating saw from Black+Decker has several of today’s recip saw features: a tool-free blade change mechanism, variable speed control, and a pivoting shoe. It delivers strokes that measure ⅞ in in length, making it an ideal tool for cutting thinner materials that require a relatively smooth and fast cut or anything that you do not want to cut into too deeply. It can cut at anywhere between 0-3,000 spm with a nominal voltage of 18V (initial voltage is 20V). Makita’s XRZ01Z is another compact recip saw that cuts aggressively but efficiently at a variable speed range of 0-3,000 spm and a ½-in stroke length. A reciprocating saw is expected to make anything but a smooth cut, but there are times when you would need a little accuracy. It has a tool-free blade change system that helps minimize downtime and an LED that improves visibility. The rubberized soft-grip handle improves grip and minimizes fatigue and vibration. Finally, you can easily control your cutting speed with the speed trigger located on the handle. This recip saw from Ryobi has a variable speed range of 0-3,100 strokes per minute, ensuring smooth and swift cuts with soft starts. The variable speed trigger works in tandem with an electric brake to improve safety while cutting. Its tool clamp allows blade changes without the use of tools while its overmolded front grip and handle increase comfort and reduce fatigue during long periods of cutting. Finally, the pivoting shoe lets you have more control over the depth of each cut. Instead of thinking of things your recip saw can do, you will find it easier to think of things it can’t do. A reciprocating saw like DeWalt’s DC385B has a ton of applications, making itself an indispensable tool in your shop. Its compact size and light weight allow for easy storage and use even for extended work hours. The variable speed control, combined with an inch-long stroke, make the DC358B flexible enough to handle most operations. This saw’s main feature, though, is the four-position blade clamp which makes it possible for you to make flush cuts in any direction. The other features like the keyless blade clamp and the open-top pivoting shoe further add to this saw’s appeal.